Uthayakumar: Actor not Anwar Ibrahim. Conspiracy to politically assassinate Anwar Ibrahim as opposition’s rallying figure. But no compromise on Indian poor. On 29/4/2011 P. Uthayakumar received an envelope by air mail post in his letter box. The white colour envelope had five stamps with the picture of the Thai King and bearing post mark “Suam Phlu” and an Air Mail Sticker . P. Uthayakumar was puzzled with his full name and address on the envelope as none of his friends have the same information though they know where he lives. Having watched the video Uthayakumar was disgusted with the level of gutter politics played by UMNO and their Police Special Branch. Uthayakumar said he viewed the CD and felt it was not Anwar Ibrahim. 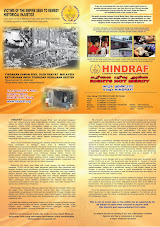 On 1/5/2011 nine other Hindraf and HRP activists viewed the said CD and were all also convinced that the actor was not Anwar Ibrahim.